Organic Fuji Apples sprinkled with Japanese citrus yuzu juice baked with oats, brown sugar and spelt spell deliciousness in any season. 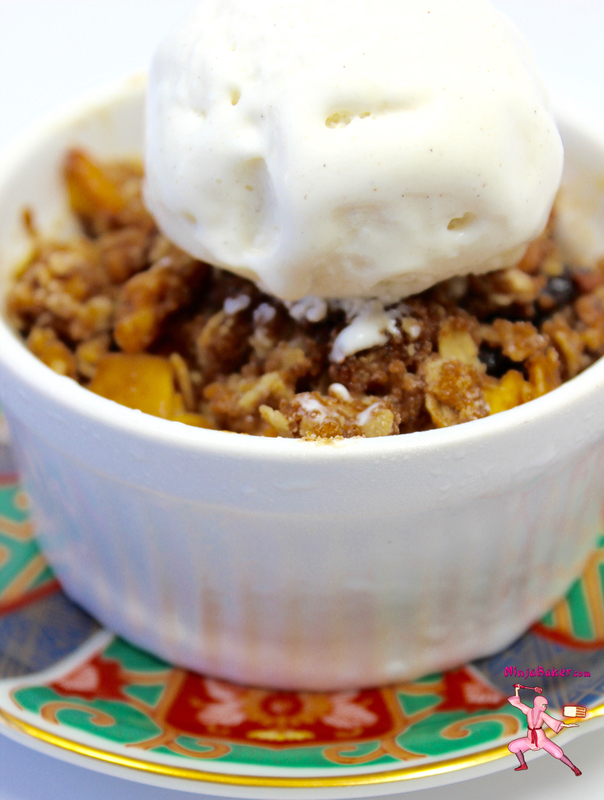 The sweet crunch of the crumble mingles with the tart apples and is yummy! Patience is required for chopping the Fuji apples into bits. The trick is to play a TV show you love so time passes quickly. The rewards of this healthful but delicious dessert are well worth the time in the kitchen. Ninja Note: The Japanese yuzu fruit is more bitter than a lemon or lime. So, the apples don’t taste as sweet. If you prefer, a sweeter apple crisp, use lemons. Use a combo of lemons and limes if you don’t want to buy the Japanese yuzu citrus juice online or at your local Asian market. This recipe is adapted from The Love & Lemons Cookbook . As you chop the apples, sprinkle with Japanese citrus yuzu juice. Toss together the oats, nuts, spelt, brown sugar, spices and salt in a bowl. with the Japanese yuzu juice sprinkled Fuji apples. Work the coconut oil into the mix along with the cherries. Press into the ramekins. Top with the remaining oats/nuts/sugar ’n spice mixture. Rotating halfway, bake for 36 minutes or until the apples look golden brown.